Working as Assistant Professor in Mechanical Engineering Department, School of Engineering and Technology, IFTM University, Moradabad. (Since 14th September, 2015). Submitted Ph.D. thesis entitled “Analysis of Parallel Manipulators using Flexible Joints” on 25th June, 2018 in Mechanical Engineering Department at Jamia Millia Islamia (A Central University), New Delhi. Three Years Teaching Experience - Worked as Assistant Professor in Mechanical Engineering Department, College of Engineering, Teerthanker Mahaveer University, Moradabad. (24th August, 2012 – 31st August, 2015). 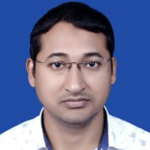 Three Years Teaching Experience (14th September, 2015 – till now) - Working as Assistant Professor in Mechanical Engineering Department, School of Engineering, IFTM University, Moradabad. (14th September, 2015 – till now).